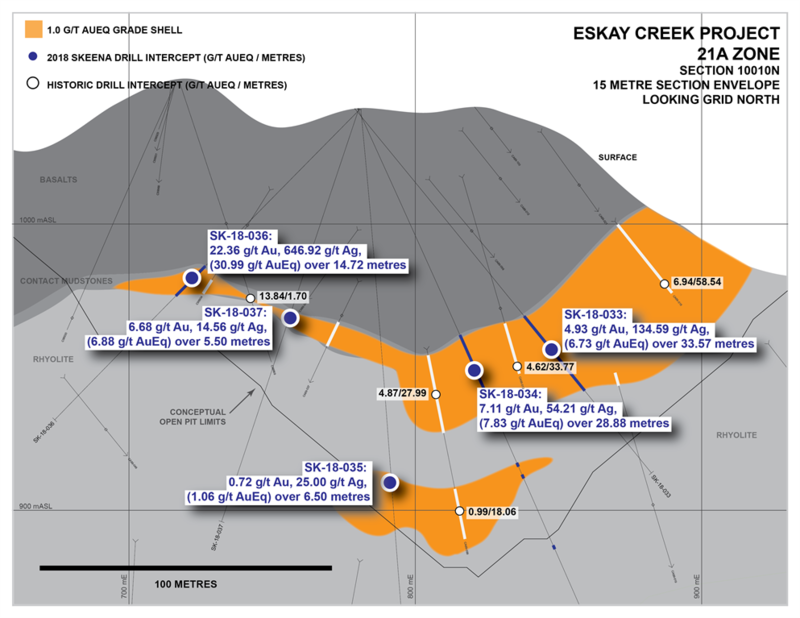 VANCOUVER, BC / ACCESSWIRE / January 15, 2019 / Skeena Resources Limited (OTCQX: SKREF) (TSX.V: SKE) ("Skeena" or the "Company") is pleased to announce additional Au-Ag drill results for eight holes from the recently completed Phase I surface drilling program at the Eskay Creek Project ("Eskay Creek") located in the Golden Triangle of British Columbia. The multifaceted Phase I program focused on the 21A, 21C and 22 Zones. Assays reported in this release are from the 21A Zone; assays from the remaining 22 Zone will be released once finalized. Reference images are presented at the end of this release as well as on the Company's website. In December 2017, Skeena secured an option to acquire 100% interest in the Eskay Creek property. Discovered in the Golden Triangle in 1988, the former Eskay Creek mine produced approximately 3.3 million ounces of gold and 160 million ounces of silver at average grades of 45 g/t gold and 2,224 g/t silver. Eskay Creek was once the world's highest-grade gold mine and fifth-largest silver mine by volume. Skeena Resources Limited is a junior Canadian mining exploration company focused on developing prospective precious and base metal properties in the Golden Triangle of northwest British Columbia, Canada. 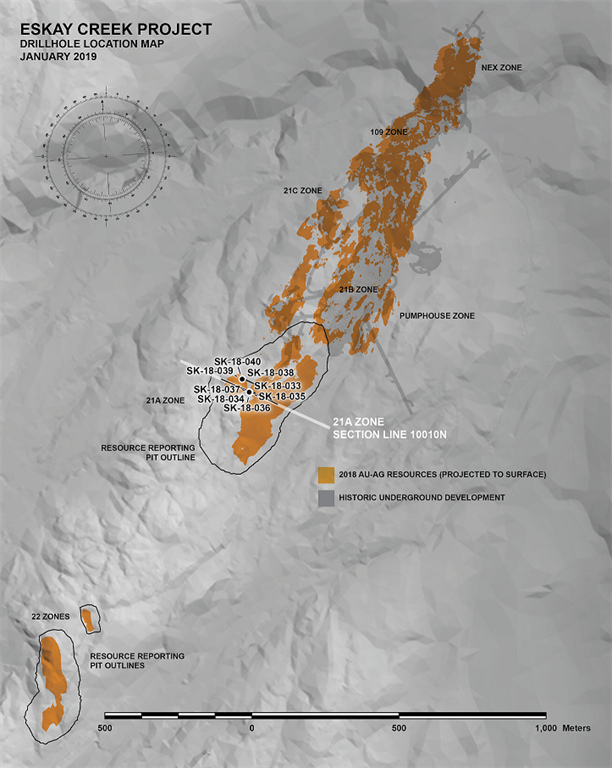 The Company's primary activities are the exploration and development of the past-producing Snip mine and the recently optioned Eskay Creek mine, both acquired from Barrick. In addition, the Company has completed a Preliminary Economic Assessment on the GJ copper-gold porphyry project. Once received from the drill and processed, all drill core samples are sawn in half, labelled and bagged. The remaining drill core is subsequently securely stored on site. Numbered security tags are applied to lab shipments for chain of custody requirements. The Company inserts quality control (QC) samples at regular intervals in the sample stream, Including blanks and reference materials with all sample shipments to monitor laboratory performance. The QAQC program was designed and approved by Lynda Bloom, P.Geo. of Analytical Solutions Ltd., and is overseen by the Company's Qualified Person, Paul Geddes, P.Geo, Vice President Exploration and Resource Development. Drill core samples are submitted to ALS Geochemistry's analytical facility in North Vancouver, British Columbia for preparation and analysis. The ALS facility is accredited to the ISO/IEC 17025 standard for gold assays and all analytical methods include quality control materials at set frequencies with established data acceptance criteria. The entire sample is crushed and 1kg is pulverized. Analysis for gold is by 50g fire assay fusion with atomic absorption (AAS) finish with a lower limit of 0.01 ppm and upper limit of 100 ppm. Samples with gold assays greater than 100ppm are re-analyzed using a 50g fire assay fusion with gravimetric finish. Analysis for silver is by 50g fire assay fusion with gravimetric finish with a lower limit of 5ppm and upper limit of 10,000ppm. Samples with silver assays greater than 10,000ppm are re-analyzed using a gravimetric silver concentrate method. A selected number of samples are also analyzed using a 48 multi-elemental geochemical package by a 4-acid digestion, followed by Inductively Coupled Plasma Atomic Emission Spectroscopy (ICP-AES) and Inductively Coupled Plasma Mass Spectroscopy (ICP-MS) and also for mercury using an aqua regia digest with Inductively Coupled Plasma Atomic Emission Spectroscopy (ICP-AES) finish. Samples with sulfur reporting greater than 10% from the multi-element analysis are re-analyzed for total sulfur by Leco furnace and infrared spectroscopy. Certain statements made and information contained herein may constitute "forward looking information" and "forward looking statements" within the meaning of applicable Canadian and United States securities legislation. These statements and information are based on facts currently available to the Company and there is no assurance that actual results will meet management's expectations. Forward-looking statements and information may be identified by such terms as "anticipates," "believes," "targets," "estimates," "plans," "expects," "may," "will," "could" or "would". Forward-looking statements and information contained herein are based on certain factors and assumptions regarding, among other things, the estimation of mineral resources and reserves, the realization of resource and reserve estimates, metal prices, taxation, the estimation, timing and amount of future exploration and development, capital and operating costs, the availability of financing, the receipt of regulatory approvals, environmental risks, title disputes and other matters. While the Company considers its assumptions to be reasonable as of the date hereof, forward-looking statements and information are not guarantees of future performance and readers should not place undue importance on such statements as actual events and results may differ materially from those described herein. The Company does not undertake to update any forward-looking statements or information except as may be required by applicable securities laws.